An architecturally beautiful city filled with historic sites and a rich array of cultural resources, Boston is the commercial and cultural capital of New England. 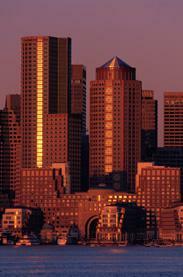 Boston is American history, from Paul Revere's famous ride to the Boston Tea Party. A pedestrian-friendly city, Boston's compact size and excellent public transportation system makes it easy to get around. Neighborhoods range from Beacon Hill's cobblestoned streets lined with 18th and 19th century mansions and townhouses, to the refurbished South End and Back Bay, and interesting ethnic neighborhoods like Chinatown, and the North End, an Italian neighborhood full of European style cafes and restaurants. This self-proclaimed "Thai gourmet" lives up to its claim to rate as one of the best in town. An Italian near Kendall Square that consistently pleases. Boston's best sushi is served through the wee hours. Legendary seafood, especially lobster. There are now 9 in the Boston area. And, you can always have a lobster Fed-Exed out!! One of Boston's best (probably the best) Mexican restaurants serves up cuisine as authentic as any you could find in the owner's native Guadalajara. Easily the best Indian food in Cambridge and some of the best in the city. Teas from around the world properly brewed and served in a cozy, Cantabrigian tearoom. For you Brits who desperately need a good cup of tea! You can actually pour boiling water over tea bags! Learn about one of the most significant events of pre-revolutionary America through exhibits, films and memorabilia. Visitors may walk the decks of a working replica of one of the ships boarded by the colonists in 1773. The chance to partake in throwing over a bale of tea is also available. This Episcopal Church was built in 1723, and is now a part of the Freedom Trail. The steeple of this church was used to hang the lanterns that set of the War of Independence. Nicknamed "Old Ironsides" because cannonballs bounced off its thick wooden hull, this ship is the oldest commissioned warship afloat in the world. The USS Constitution is located in Charlestown Navy Yard. Billed as the last 17th-century house left standing in Boston, this structure commemorates Paul Revere, one of the United States most known historic figures. >>Search Pollstar for live music in Boston!